San Diego State alum Ashley Henderson stunned reigning Olympic champion Elaine Thompson of Jamaica at the inaugural Athletic World Cup in London on Saturday. Henderson edged out Thompson in the 100-meter dash for the win. She burst out of the blocks in a textbook drive phase and held off a strong finish by Thompson. Henderson finished with 11.07 seconds over Thompson’s 11.09. It was Henderson’s first international competition. 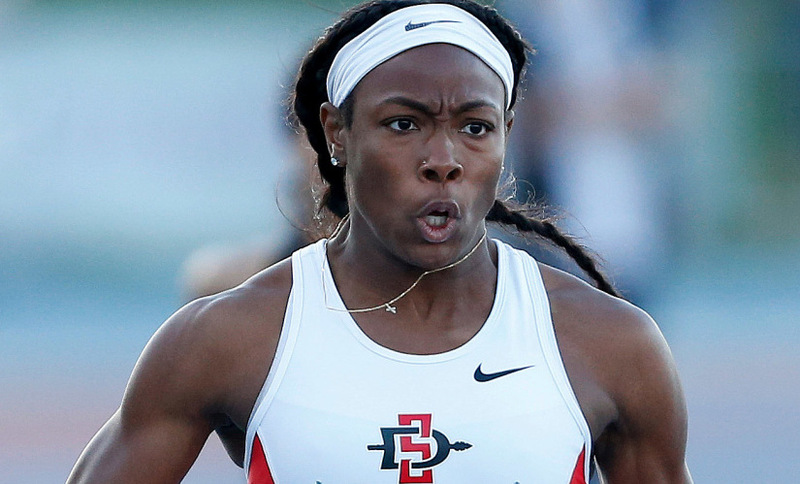 In her last race as an Aztec, she finished in disappointing sixth in the 200-meter dash at the NCAA Championships in June. She was the favorite to win the 100-meter in that meet but didn’t qualify for the finals. She recovered at the USA Track & Field Outdoor Championships on June 22 in Des Moines, Iowa, taking second place at the 100-meter dash and setting a new personal best time of 10.96 seconds. The Athletic World Cup features 17 countries competing in 17 men’s and women’s events, with one athlete representing each country per event. Henderson was the U.S.’ entrant in the 100-meter. There is no individual prize money and the $450,000 prize for the top team is shared among the athletes. The U.S. is currently in first place after the first day of competition, which ends Sunday with the final 17 events.